Accumulators are storage vessels that hold fluid under pressure and are commonly used in fluid power systems to store fluid as energy to be released on demand. 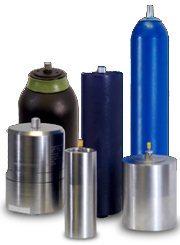 When used in hydraulic circuits and machinery, they are sometimes referred to as hydraulic accumulators or hydropneumatic accumulators. Accumulators are also used to eliminate pulsations for a smooth fluid flow and protect systems from hydraulic shock. The most popular design has an internal bladder that acts as a separator between the stored fluid and a compressed gas charge. Accumulators are used in a variety of applications across multiple industries to increase system productivity and lower operating costs. BLACOH offers a full line of Accumulators specifically designed for the fluid power market, with single body construction for maximum safety in high pressure applications. NOTE: Some Accumulator models offered by BLACOH may be manufactured by North American or European partners.